Next, we visited the island of Maui and drove up to see Haleakala. Haleakala (House of the Sun) is a 10023 ft. high shield volcano that covers over 75% of the island of Maui. From the summit we looked down on a massive depression that includes volcanic cones. The biggest danger that day was not driving off the road on the way down as we looked down on the clouds onto a beautiful rainbow! We also happened to see a Pueo, Hawaiian Owl, as we were driving down from the mountain. 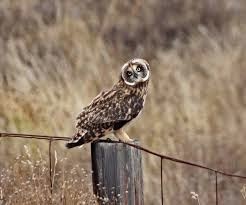 I didn't get to photograph it but here is what the owl looks like. Next stop: The Big Island of Hawaii and the Kilauea Volcano.